Angel Wings For Ellie Potvin. Ellie received her wings at 11:35 this morning, in her mother’s arms. Our prayers and love go out to Amy, Tim, and twin sister Grace Potvin. If I’m thankful for a few things, it’s that Ellie was blessed with a loving family and a mother like Amy. Let’s keep the family in our prayers as they navigate a world without their beloved Ellie. 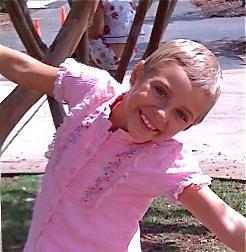 People the world over will be wearing pink this Saturday, the day of Ellie’s funeral, to honor this brave little girl. Pink balloons will also be released at 1 pm EST. If you’d like to join in, just put on your best pink and let your balloons fly up to Ellie. More money, research, and modern treatment protocols are needed to treat and eradicate childhood cancer. No child should have to experience the ravages of this merciless foe. Sadly, Ellie is just one of the many courageous children gone too soon. Today, Heaven burned a bit brighter, and the world a bit dimmer. Run and play, Ellie, in your new-found wholeness. Thank you for all you’ve taught us about kindness, faith, family and life. You’ll forever live on in our hearts. If ever there is tomorrow when we’re not together. There is something you must always remember. You are braver than you believe, stronger than you seem, and smarter than you think. But the most important thing is, even if we’re apart… I’ll always be with you. I am a HUGE Anne Frank fan. I first read her diary when I was nine-years-old, and as a girl who kept a diary, (and with early writing and publishing aspirations, myself), I always felt I understood her in an added dimension — a dimension shared between writers. I’ve always thought of Anne as both hero AND writer. In my mind, her diary remains much-needed evidence of how the written word, a sensitive heart, and a brilliant mind can both warm and light the path we travel as humanity. Callooh! Callay! O frabjous day! 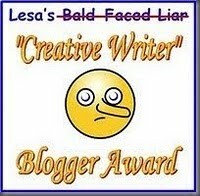 Lefty In My Write Mind received the “Creative Writer Blogger Award” from the lovely Jeanne Lyet Gassman. Jeanne’s Writing Desk: Blog Award!